On Nov. 9, 1967, the first Saturn V launched. It shook buildings, broke windows, and its power caught many people at the Cape Canaveral launch site off guard. But more impressive was the fact that this first launch was the first test for a number of its parts, and that it launched an actual mission that helped get Apollo to the moon. The launch was, to put it modestly, an incredibly gutsy decision. With that kind of explosive power, it would make sense to test each of the three stages separately before stacking them for a mission. But in the 1960s NASA didn't have time to take it slow. That end of decade lunar landing deadline was fast approaching and the Saturn V was the only ticket to get there. Development on the Saturn V formally began on Jan. 10, 1961, when NASA announced its intention to build what was then called the C-5 rocket. Designed by Wernher von Braun and his German engineering team, it was a follow-up rocket to the successful Jupiter series. That's how Saturn got its name; it's the next planet after Jupiter. Von Braun brought the same conservatism to the Saturn V program, but George Mueller wasn't having any of it. Mueller assumed responsibility for the Apollo program as Director of the Office of Manned Space Flight in 1963, and he immediately realized that NASA would never make it to the Moon by the end of the decade without a more forceful approach to its rocket development program. Drawing from his experiences with the U.S. Air Force's ballistic missile program, he called for NASA to adopt an "all-up" approach to its rocket tests. Rather than testing components separately, the standard approach in NASA's early days, he wanted von Braun to test the full rocket all in one go. Mueller's was an unconventional approach. Instead of beginning with a ballasted first-stage flight then adding a live second stage only when the first had been proven flightworthy, he wanted the very first Saturn V test to be done with all three live stages. He also wanted that first flight to carry a live Apollo Command and Service Module as payload so their systems could be tested in orbit. The mission would follow a trajectory that would have the Command Module reenter the atmosphere as though it were returning from the moon, adding a heat shield test to the program. Von Braun and his team balked at Mueller's proposal. They argued that consolidated testing made it impossible to pinpoint where failures occurred; they'd learned the hard way that testing a complicated rocket piece by piece was the only way to make sure each piece worked. If a failure like an explosion on the launch pad occurred while testing multiple systems at once, they would never know which component had failed and they'd be no better off. It never paid to introduce more than one major change between tests. Not to mention the Saturns weren't being mass produced like the rockets NASA bought from the military for launches. They had to make sure they built them right. Mueller fought back. He pointed out that stage-by-stage testing spread the risk of failure across multiple tests rather than minimizing them in one. He also knew that time wouldn’t favor a sequential approach to testing. In the end, it came down to rank. Where the Apollo program was concerned, Mueller outranked Von Braun and NASA implemented "all-up" testing for Apollo. It was a decision that ultimately saved the program. 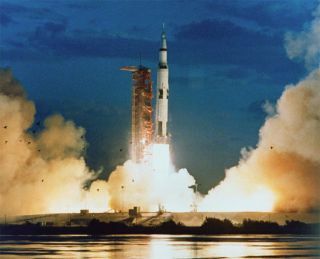 Designated Apollo 4, the first Saturn V launch was a stunning success. Only Apollo 6 saw another unmanned Saturn launch. The third Saturn rocket NASA ever launched took the Apollo 8 crew to the Moon in December 1968.